A group of passionate people are putting their heads together (and getting their feet muddy) to create a learning centre on Pulau Ketam. Not just any ordinary centre, but a low impact, self-sustaining and eco-friendly zone to promote learning and nature appreciation. Mallika Naguran from Gaia Discovery joins this group as team member and brings us the inside story. Pulau Ketam - small but rich in biodiversity. Singapore, 26 May 2013. Not many people know of Pulau Ketam in Singapore, but soon, this could very well change. Literally translated as “crab island” from the Malay language, Pulau Ketam is a narrow strip of land across a channel from Pulau Ubin' south. It has not attracted much attention until now. There are plans to revive Pulau Ketam into a living nature nucleus for mostly students, researchers and nature enthusiasts. But first it needs an injection of life. Rustic and quiet except for fish pens and the call of birds, Pulau Ketam offers new ecological encounters in Singapore. Professor Tay Kheng Soon, a conservationist and well-known architect in Singapore with Akitek Tenggara, hatched on a plan to restore Pulau Ketam to its original nature. “I remembered a time where the island was full of mangroves and crabs,” he said while introducing the project at a seminar. Mangrove forests help prevent erosion and provide nurseries for juvenile fishes. The Rhizophora species on Pulau Ketam are the most abundant. Pictured here are the same species photographed on Pulau Semakau. The island today has lost much of its mangrove forest habitats due to factors such as shore erosion, wave energy and forced clearance to make way for fish farm facilities and artificial ponds. Although fish farms are no longer there, an aquaculture business is thriving on the southern edge of the island. Pulau Ketam has beach forest habitat as well, which is worth studying and documenting. Pulau Ketam has beach forest habitat as well, which is worth studying and documenting.The Pulau Ketam project is envisaged to be a public-private social enterprise that is open to individuals and societies joining it. It has found initial core support from the Nature Society Singapore (NSS), National University of Singapore (NUS) in particular the alumni committee members of the MSc (Environmental Management) program, and the Singapore Power Boat Association (SPBA) through its charity programme. The motivation for the project is simple – to re-introduce city dwellers in Singapore back to nature, and to pose different options for sustainable living even as the country plans for further land development. “We need to have a total rethink of urbanisation,” pronounced Tay at a seminar entitled "Our Heritage in Nature" organised by NUS' MSc (Environmental Management) alumni and NSS on 11 May 2013. Sustainable living, for instance, provides for nature conservation, biodiversity and food security. Gerry de Souza (standing far left) briefs the group of volunteers before they set out to Pulau Ketam. Just two weeks after the seminar where the plan was announced, parties came together to kickstart the plan. 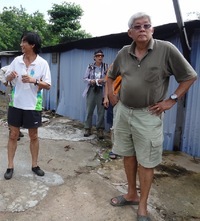 More concrete plans for the Pulau Ketam project began to unfold and a site visit was planned. The plans are still rather preliminary and they are subject to further site surveys and ecological studies before a formal concept plan can be crafted. Following these stages, the committee hopes to then approach the Singapore government with a proposal and concept plan for support. According to the Singapore Master Plan 2008, Pulau Ketam is designated an agricultural area in the east, and an open space area in the west. In the 2013 Land Use Plan, the entire island is zoned for open space/recreation/agriculture, which makes it ideal for the planned project. The objectives of the Pulau Ketam project are clear: to provide learning opportunities by observation and hands-on discovery in a safe and sustainable manner. A floating platform will be anchored on the coastline with around 100 beds in a dormitory styled long house for convenient overnight stays for students, teachers, guides, researchers and even wardens. It will be a minimal impact building that is self-sustaining without polluting the environment. Leong Kwok Peng from Nature Society Singapore (left) joins the survey on Pulau Ketam with Prof Tay Kheng Soon (far right).“There will be no waste,” said Tay, outlining thoughts on having an anaerobic biodigester to process human waste into byproduct biogas that can be used for the kitchen’s cooking facility. The platform will be anchored into the shallow seabed by piles. Renewable energy, rainwater harvesting and sewage treatment will contribute towards an autonomous operation. The platform can have fish farm extensions and a rooftop vegetable farm. “These by themselves provide excellent learning opportunities on sustainable living while helping communities with food security and self-sufficiency,” said Gerry de Souza, President of the SPBA and firm supporter of the project. “The platform will be itself be an educational demonstration of integrated eco-engineering and environmentally sustainable practice,” said Tay. Subject to further ecological studies and environmental impact assessment, Tay hopes to introduce fireflies and crabs to the island. “The plan is to restore all the native vegetation, bring back fireflies and enable original marine life back into the mangrove,” he said. “The spectacular fireflies would mean a greater attraction for Singapore,” said Tay, hoping that eco-tourism will provide for greater community engagement. Boaters and kayakers can rest up at this platform as well. Mangroves, beach forest and woodlands are a few of the natural habitats that can be found on Pulau Ketam, with lots of wildlife including birds. Funding for the project will largely come from fundraising by SPBA through their various outreach programmes. As the project is still being planned, the team looks forward to getting more contributions from other entities and individuals, and especially welcomes feedback and suggestions. Pulau Ketam has some mangroves growing on the coastline, but not a lot, observed Dan Friess, an Associate Professor with NUS Geography department and a mangrove expert who was part of the surveying group. He noted that there were a few species such as the Rhizophora with propagules nearly a metre long - "like Christmas trees!" - he exclaimed. On the west end were flowering Bruguiera gymnorrhiza with bright red petals. “There is a significant beach forest habitat as well, which is quite rare for Singapore,” he said. While trekking around the east side of the island, the project team saw patches of bare land without trees and disused ponds. This means reforestation will be a viable project with student participation for a richer learning experience. 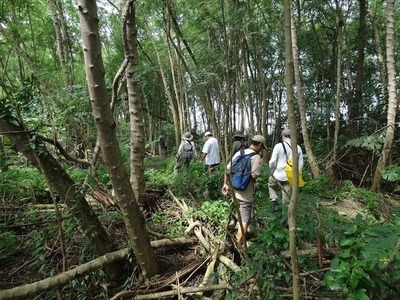 Grey herons were among the 22 bird species noted in just two hours on Pulau Ketam by Nature Society Singapore. Singapore has suffered more than 95 percent of habitat loss. The scale of mangrove forest cover in the 1800s was estimated at 13 percent of Singapore’s land area. Today, mangrove forests constitute less than one percent, with small patches found in the northern areas and on Pulau Tekong, Pulau Ubin and Pulau Semakau. Mangrove forests that are left are sadly to small to support complete ecosystems. Otters are being spotted in wetlands such as Lorong Halus (smooth coated otter) and Pasir Ris Park in addition to resident otter territory Sungei Buloh (small clawed otter). An initial plan for eco centre on Pulau Ketam. Bird watchers will have a field time on Pulau Ketam, and an elevated boardwalk will enable controlled numbers of such enthusiasts to explore the island without spooking or trampling on wildlife. The project’s supporters recorded 26 bird species during their two hour recce on 25 May 2013. A rare sighting was three fluttering little egrets - migratory birds that have stayed on longer in Singapore than they normally do. Other birds observed were grey herons (posing for us), white-bellied sea eagles, Brahminy kites, plaintive cuckoo, collared kingfisher, straw-headed bulbul and a nesting large-tailed nightjar (see below for a full list). Proposal by Tay Kheng Soon: 100m x 40m floating platform ensures minimal impact on land and marine habitats. Proposal by Tay Kheng Soon: 100m x 40m floating platform ensures minimal impact on land and marine habitats.The group came across the skeleton of a male red junglefowl. Local fishermen reported spotting an extraordinary family of otters – up to 39 of them apparently, and related it to Captain William, who joined us on this trip. If the project comes to fruition with the blessing and support of the Singapore government, thousands of nature lovers will one day be able to share the pleasure of watching wildlife such as otters, white-bellied sea eagle and grey herons from the comfort of a fully self-sufficient and sustainable ecological centre on Pulau Ketam. Photography by Capt John Lum, Dan Friess and Mallika Naguran. People or organisations that are interested in joining the group, please write to Bu Fan at bufan001@yahoo.com or Nelson Lo at lo.nelson2@gmail.com, both are leaders of NUS' MEM Alumni. Bird Species (Heard or Seen) on Pulau Ketam, Singapore during a rapid survey on 25 May 2013. Recorded by the NSS Bird Group members Wing Chong, Lee Ee Ling, Willie Foo and Tan Ju Lin. Thank you NSS for the wonderful job.